Microchip announces two new low-cost rapid prototyping boards for 32-bit applications. The PIC32MX and PIC32MZ Curiosity Boards include an integrated programmer debugger and are fully incorporated into Microchip’s MPLAB® X Integrated Development Environment (IDE). The boards are designed for developing 32-bit applications and feature a wide range of peripherals, as well as user interface and expansion options including two mikroBUS™ click interface headers to support over 180 MikroElectronika click boards™. Both boards offer a rich feature set at an affordable price and are designed to be connected and used out-of-the box. Customers can run example projects without writing any code. The PIC32MZ EF Development Board features a 200 MHz PIC32 microcontroller (MCU) with an integrated Wi-Fi® module and is ideal for designing Internet of Things (IoT) and connectivity applications. 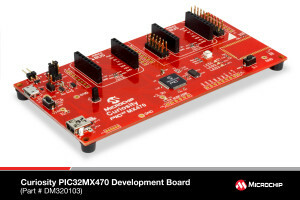 The PIC32MX470 Development Board features a 120 MHz MCU and has been designed for audio, Bluetooth® and other related generic applications. In addition, both boards have USB connectors that can be used to develop USB host or device applications. The boards are fully integrated into Microchip’s MPLAB X IDE as well as the award-winning software development framework, MPLAB® Harmony. MPLAB Harmony is a flexible, modular, abstracted and fully integrated firmware development platform for PIC32 MCUs. It gives users access to a wide variety of peripheral libraries, RTOS capabilities, middleware, drivers and system services. In addition, it features over 200 pre-tested application project codes that can be used to jump start application development. The Curiosity PIC32MZ EF Development Board (DM320104) is available starting December 2016 and is priced at $47.99. The Curiosity PIC32MX470 Development Board (DM320103) is available now and is priced at $27.99.